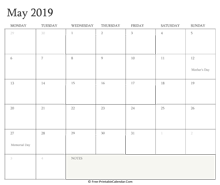 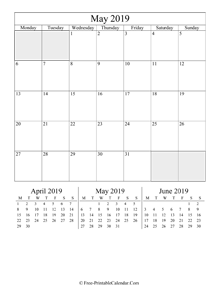 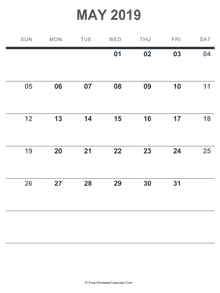 May 2019 Calendar Templates - Free, easy to download and print a monthly calendar for may 2019 from various formats. 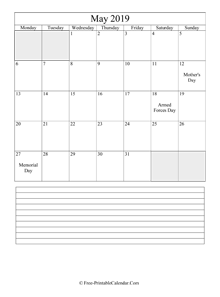 Those calendars come with holidays, observances, moonphases or notes space but you can easy to edit and add your own important events. 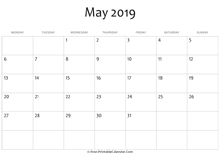 All our May 2019 Calendar Templates are free for personal use only and if you think they are useful please link to us. 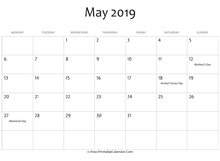 Just copy & paste the following code to your site or blog to share FREE MAY CALENDAR TEMPLATE.